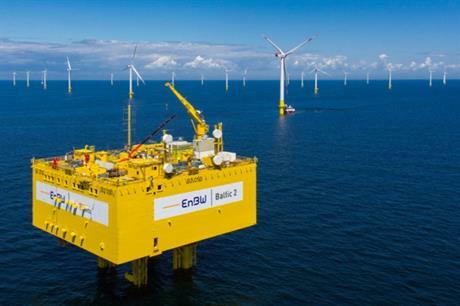 GERMANY: Low offshore wind and hydropower yields reduced utility-developer EnBW's earnings from renewables in the first nine months of the year, it stated. Adjusted earnings before interest, tax, depreciation and amortisation (Ebitda) from renewables were €215.6 million between 1 January and 30 September, down 4.1% year on year. This also marks a drop in renewables’ share in the company’s total earnings of €1.57 billion: from 14.8% in the first nine months of 2017, to 13.7%. The utility-developer stated a lower yield at its wind farms — especially offshore — and a "continuing low water situation" was to blame for its renewables segment’s decline in earnings. It did not include generation levels for either technology in its nine-month financial results. New onshore wind farms commissioned in the last year and the slightly higher current production of hydroelectric power plants in the spring were unable to offset the fall in yields, it stated. Following the drop in earnings, EnBW downgraded its full-year forecast for adjusted Ebitda from its renewables segment. It had suggested its adjusted Ebitda to be between 10% and 20% higher than 2017, but now expects it to be between a 10% loss and growth of 5% compared to last year. Chief financial officer Thomas Kusterer added: "We are concerned about an issue that we cannot control: the weather." EnBW has 961.55MW of operational wind capacity, including 336.3MW of offshore projects and 625.25MW of onshore wind farms. It also has "around 900MW of installed capacity from run-of-river hydropower plants and "around 1.9GW" of installed pumped storage and storage hydropower plants. EnBW aims to grow its renewables business to 40% of its total power generation by 2040 (up from 12% in 2013). It also plans to have 1GW installed in Germany by 2020. The utility-developer currently has 362.45MW of operational projects, according to Windpower Intelligence, the research and data division of Windpower Monthly. Kusterer said that EnBW’s efforts to reach these targets were "developing positively". The company invested €469 million between 1 January and 30 September, primarily in expanding its electricity networks, its participation in the European gas pipeline, and in offshore wind farms, it stated. However, the company did not state how much has been invested in wind or in renewables. Overall, EnBW’s adjusted Ebitda in the first nine months of the year increased 3.3% to €1.57 billion. It recorded an increase of 10.2% year-on-year in its sales segment, 18.1% in its networks business and 3.7% from its generation and trade unit.